My eyes began to adjust to the darkness of space, and all of a sudden, pinpricks of light came into focus. They were stars, and their sudden, beautiful appearance made me quietly exclaim “wow” under my breath. I turned away, because the twisting metal chassis of the spacecraft below me was equally beguiling. 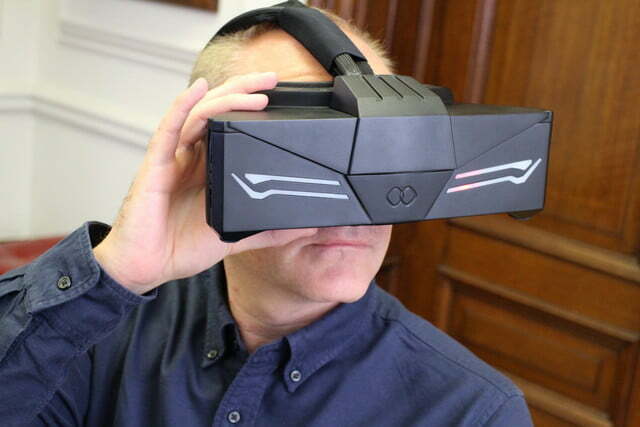 For a moment, I forgot about the Infinitus Prime tVR headset I was wearing. I was an astronaut. 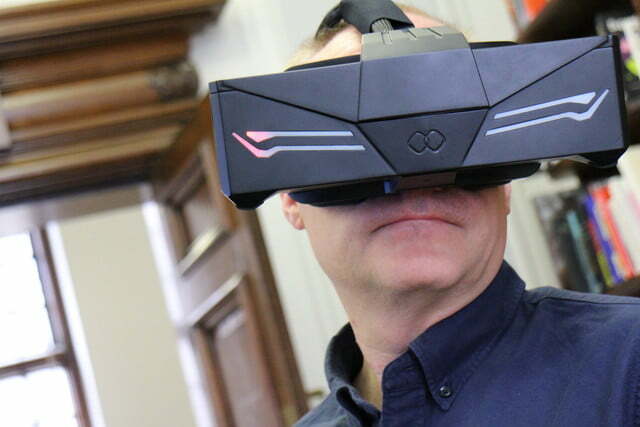 In actuality, I was in a London office, and right at the end of my time with the Infinitus Prime, a VR headset that promises technology way beyond any other commercially available VR kit. On the basis of my trip into space, it delivers. I was looking at an astonishing 20K resolution render. The stars loomed suddenly out of the blackness of space — I had to refocus to see them, after looking away from the bright blue ball we call Earth. Prior to this, the Infinitus Prime had been showing 16K renders of cities and apartments, revealing detail that you simply don’t get with 1080p or even 4K images. Text written on blackboards could be read, bricks had texture, and light spilling through windows revealed markings on the wooden floor. 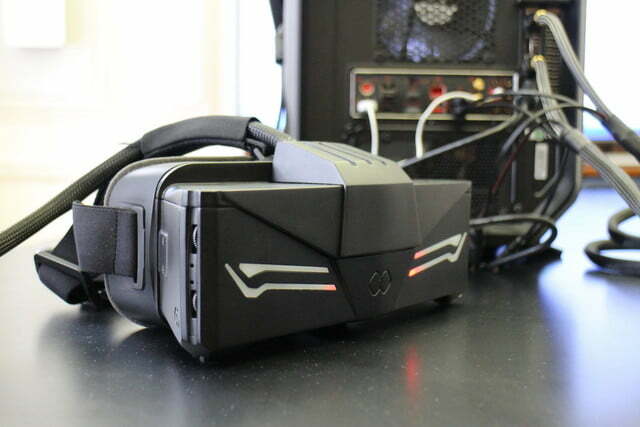 There was none of the fuzziness, the slightly unreal edge, that spoils every other VR picture. This improved the feeling of immersion, but the Infinitus Prime has another trick – its 140-degree field of vision. If you’ve tried Oculus Rift or HTC Vive, you know of the curved edges intruding on your 110-degree field of view. It diminishes the experience. Not greatly, but it’s definitely noticeable, particularly when viewing a bright scene. An extra 30 degrees may not sound much, but it’s a considerable difference. 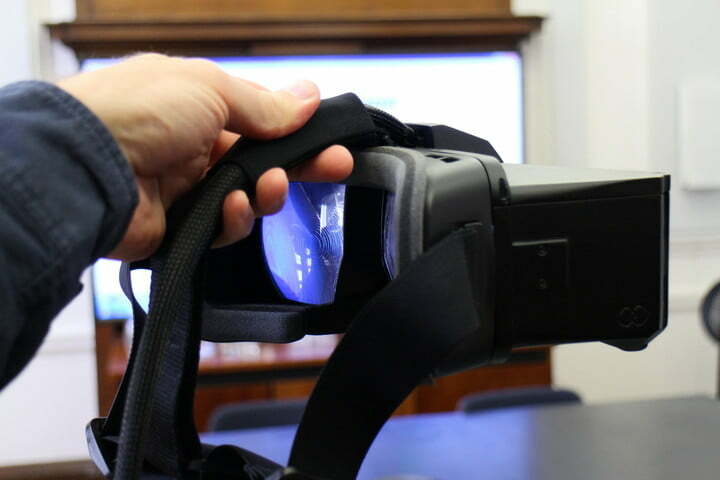 Our peripheral vision is an important part of how we view the world, and when it’s removed we feel less connected and a little confused, resulting in exaggerated head movements we must make to look around a VR world. This is reduced with Infinitus Prime. If the headset itself is uncomfortable, too heavy, or painful to wear, it doesn’t matter if what we see through VR is amazing. Despite its size, the Infinitus Prime tVR was light and extremely comfortable. I often struggle with headsets cutting into the top of my nose, but experienced no discomfort here, and the goggles fit around my face neatly. Only with Sony’s Playstation VR have I felt so at ease with a VR headset. My only complaint concerns the straps, which took some time to properly adjust. 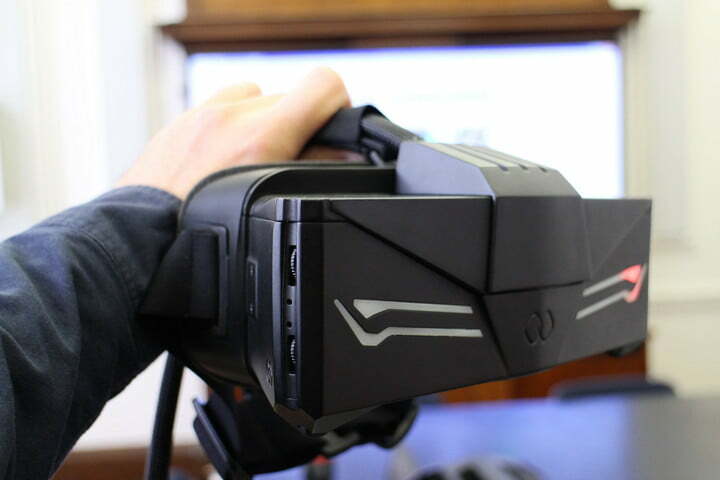 There was none of the fuzziness, the slightly unreal edge, that spoils every other VR picture. I wore the headset without my glasses on or contact lenses in, and the image remained clear and in focus. Plus, there’s a manual scroll wheel for visual adjustment. This didn’t make a massive difference, and seemed to be for fine tuning only. Like the straps on the outside, I required a few tries to get it spot on. 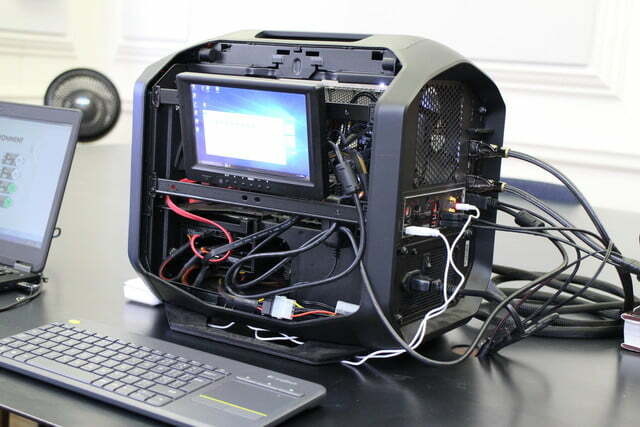 If you’re wondering what manner of monster computational power is needed to push a 20K render to a VR headset, you’ll be surprised by the answer. The PC powering the Infinitus Prime I wore had an Intel Core i5 processor, 16GB of RAM, and a mid-level VR graphics card. Nothing mind-blowing. The rig was custom made by the company, with the intention of selling it along with a headset (or headsets, as one unit can run multiple Prime tVRs) to businesses, making it simple and convenient to carry around. This is important to understand, because home users probably won’t buy the Infinitus Prime tVR headset. It’s made for commercial use, whether that’s a VR roller coaster ride, a motorsport simulator, or an architect’s virtual workspace. If it was used at home, it would be delivered by Netflix, or someone similar. This makes the tweaks needed to make it comfortable a worry, because there won’t be time for that messing around in some instances. When we first saw Infinitus Prime, the emphasis was on the hardware, and the intention was to leave the content to others. That has changed a little, and Infinitus is working with its partners to create content for the headset, right down to coding its own video player, because there weren’t any available to play the mega resolution 16K or 20K files. One of the first to come onboard was car manufacturer Skoda, which plans to reveal an Infinitus Prime tVR experience at the Auto Salon motorshow in Paris next month. Auto makers are great candidates for exploiting the high-resolution capabilities of this headset, thanks to the wealth of high quality 3D renders produced at prototype stage for new vehicles. Still, content remains an issue for Infinitus. While Google’s Jump and Nokia Ozo cameras can shoot at an 8K resolution, that’s less than half of the headset’s current ability, and few studios outside — or even inside — Hollywood are making 16K and 20K renders. 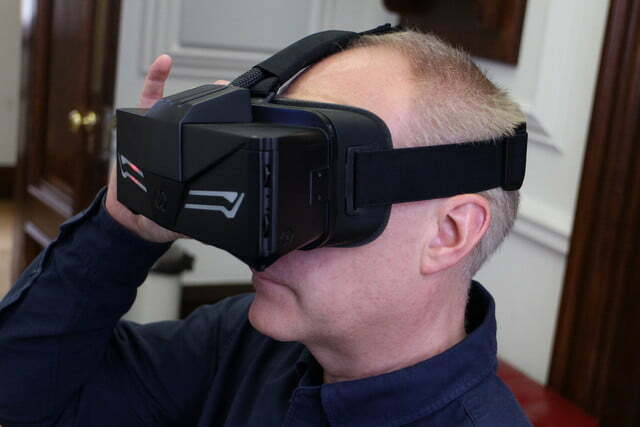 The headset was only demonstrated with fixed position video and stills. There were no games or interactive sections. 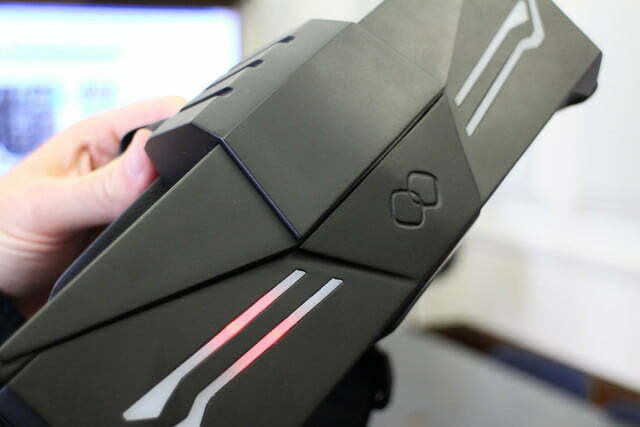 When asked about this, it was revealed there is a games company working on using the Infinitus Prime headset, and it may end up being used in a VR arcade setting, or eSports-style venue. For control methods, it’s working with Razer, and has tested out gesture control systems from Leap Motion. In the future, it wants to incorporate room tracking, and a pass through camera for augmented reality experiences. 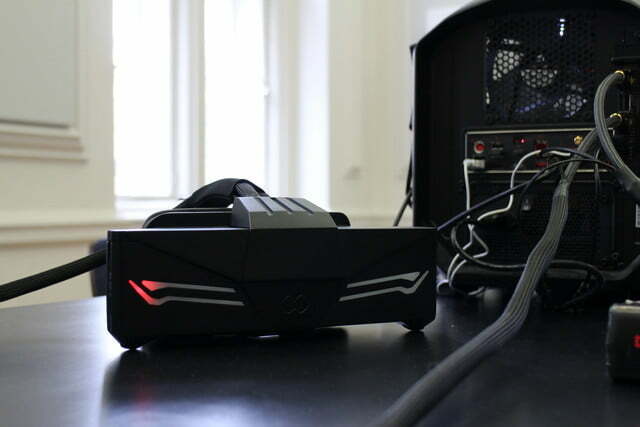 In the brief time we spent with Infinitus Prime tVR, its potential was clearly obvious, as was its early stage of development in terms of content and the ability for others to create it; and that’s the lifeblood of VR. However, if the passion, commitment, and enthusiasm that’s overwhelmingly evident in the founders — Howard Thompson and Marek Polcak — is met in equal terms by eager businesses, then that may change very soon. We’ll be watching with interest.